Two people aboard an international Delta flight headed to Newark were taken to the hospital after violent turbulence that one passenger said felt as if "King Kong picked up the plane and shook it like there was no tomorrow." 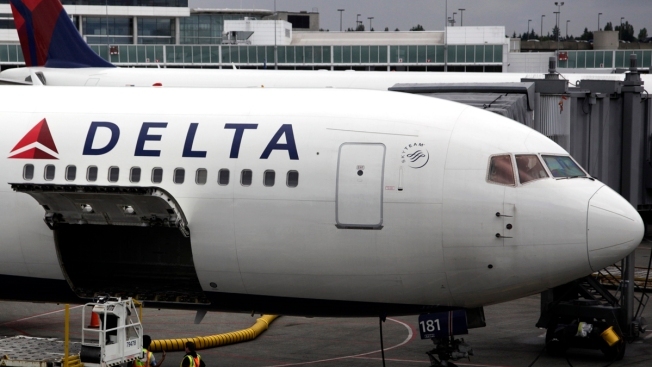 Delta Flight 271, bound for Newark from Paris, was diverted to Logan International Airport amid bad weather in the tri-state and severe air turbulence, the airline said. The plane initially tried to approach Newark during its originally scheduled landing but couldn't get down because of the storm. It then went to Kennedy to try to land there, but bad weather there also prevented a landing. The flight finally had to cut up north to Boston to make an emergency landing there. By that time, passengers felt ill.
"We kept going up, going down and dropping down -- they kept trying to get us to land and it was very turbulent while they were doing all of that," said Jessica Garcia. Another woman on the plane said there was no panic or chaos. "Everybody was calm because everybody was sick," she said. Garcia added that she was "too sick to be nervous." Delta said that "a small number of customers" on Flight 271 complained of nausea and possible minor injuries and were checked out by emergency medical technicians. A Boston EMS spokeswoman said two people were taken to Massachusetts General Hospital with what are believed to be minor injuries. The flight finally left Boston just after 6 p.m. to resume its journey to Newark, and passengers were visibly weary as they disembarked. Many who said they were seasoned travelers called it the roughest flight they'd been on. "The plane was being bucketed from left to right, and it was up and down and around and around, and out to sea and back to sea, coming to New York and then to Boston and now back to New York," said Page. But passengers added that the pilot and crew helped keep everyone calm and were in constant communication with the passengers on board. "I have to say, the crew and the captain did fantastic navigating one hell of a storm," said Page.